With adidas retiring the signature Messi “Pureagility” series, we fully expected that they would find a way to create something special as a replacement for the world’s best player. And they have in the form of a signature, laceless version of Nemeziz. Visually, there is the obvious branding distinction between the standard issue release of Nemeziz and the Messi’s version. But, there is also a whole lot in the way of performance that gives players a very different type of in-game experience. What can you expect? Details below, or find them listed at soccer.com. First off, the decision by adidas to retire a signature Messi range and replace it with a more in-brand boot might seem kind of odd. In reality, it is kind of odd. 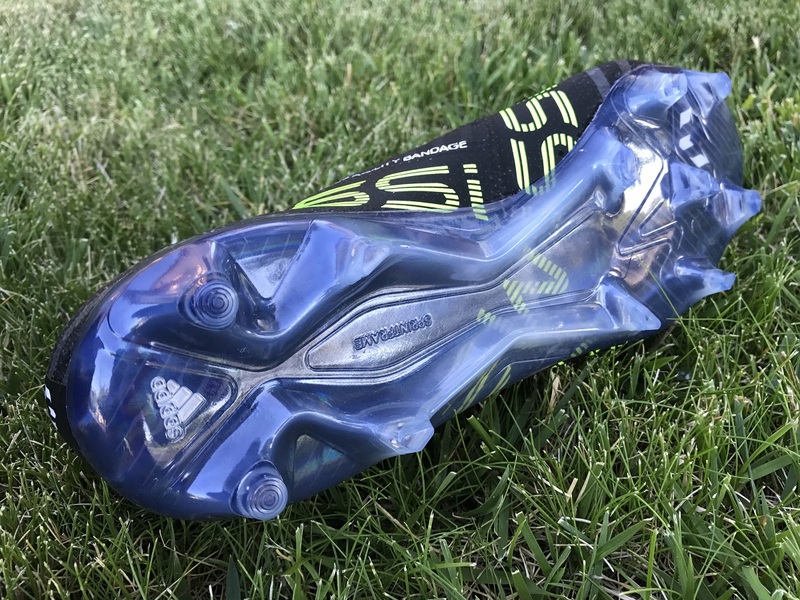 But, it also makes senses as it allow them to follow the Nike CR7 model of integrating a key players boot under the same umbrella as their standard advertised release. 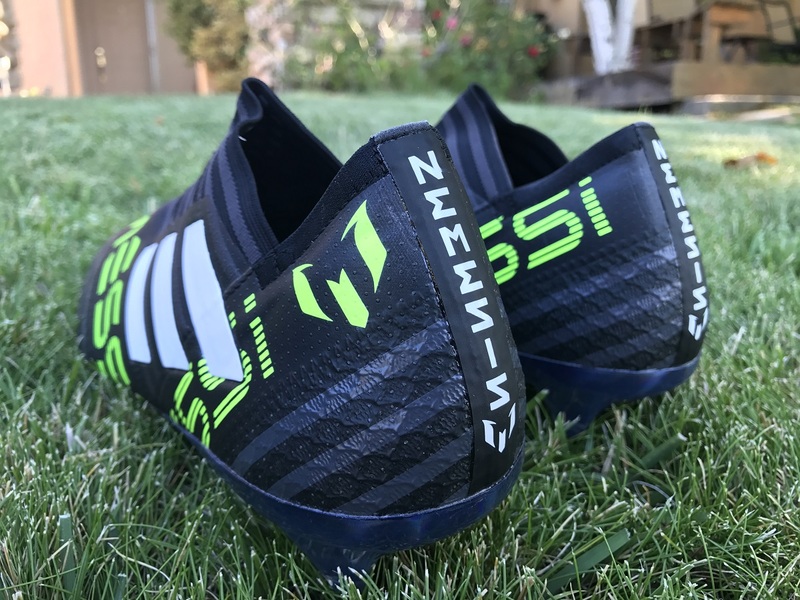 Even though Messi prefers to wear the laced version of Nemeziz, this elite level laceless version still carries his name. It is an expected part of adidas advertising strategy, as they lok to offer fans different experiences within the silo. 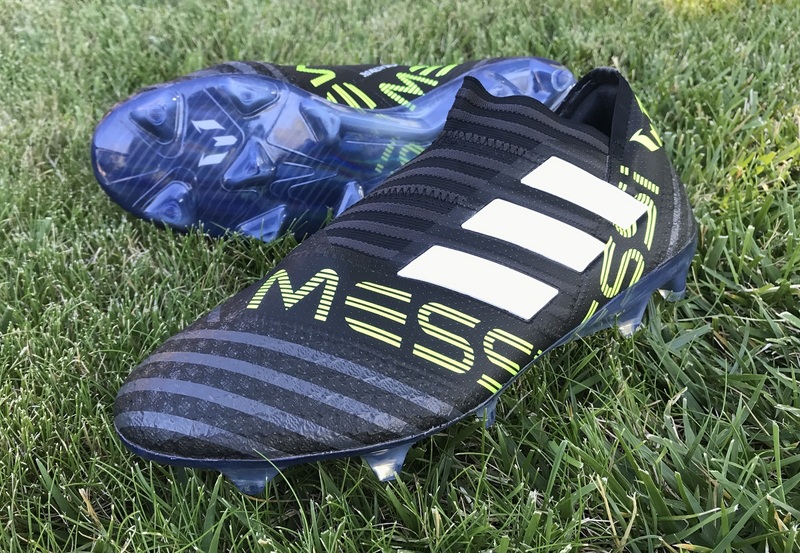 Through the initial release phase of the boot, Messi was pictured with the laceless version, but it is a slightly modified version of the Nemeziz 17.1 that he actually wears. 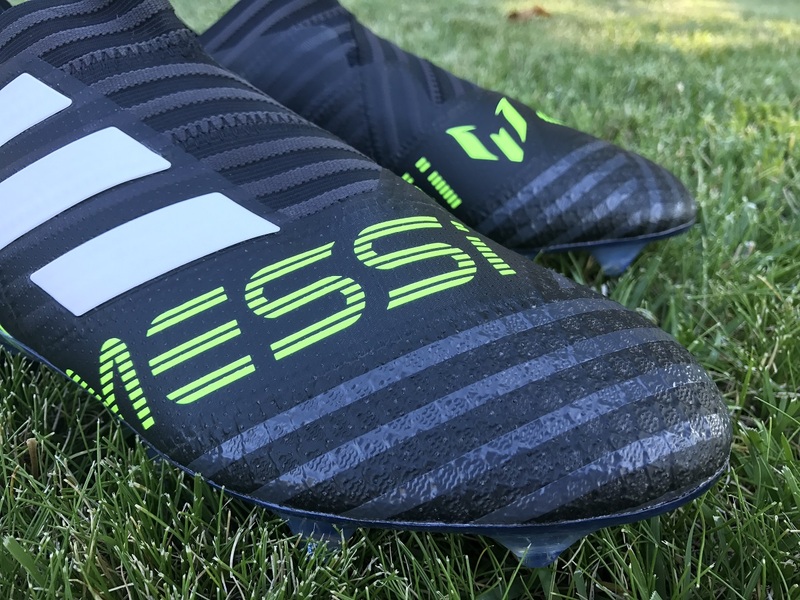 In terms of design, you get a neon green Messi text across the front of the boot to replace the Nemeziz on the standard release. Everything else is a traditional black, and that is a good thing! Let’s be honest, Messi signature boots have often taken on wild and unique color palettes. This one is simplified and will appeal to traditional fans, as long as you are ok have Messi’s name in electric yellow emblazoned across the boot. Agility Bandages – a series of elastic bandages that are integrated through the upper, designed to create a personalized compression fit around your foot. 360Torsion Tape – tape that wraps around the ball of the foot, ensuring you are secure through lateral and medial movements. Agilityknit 2.0 – a key ingredient into creating a personalized, laceless fit. A super thin interlocking yarn material that allows for more natural feel on the ball, while securing the foot in place. 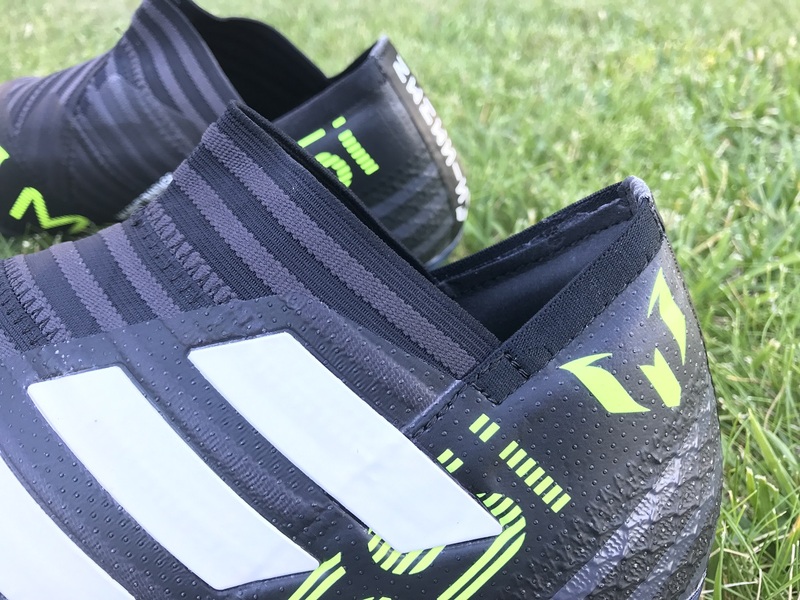 SprintFrame – underfoot, the Messi version of Nemesis borrows the soleplate found on the Pureagility series. First thing to note here is the importance of sticking to something when you find that it works. Case in point, the soleplate used on this boot. 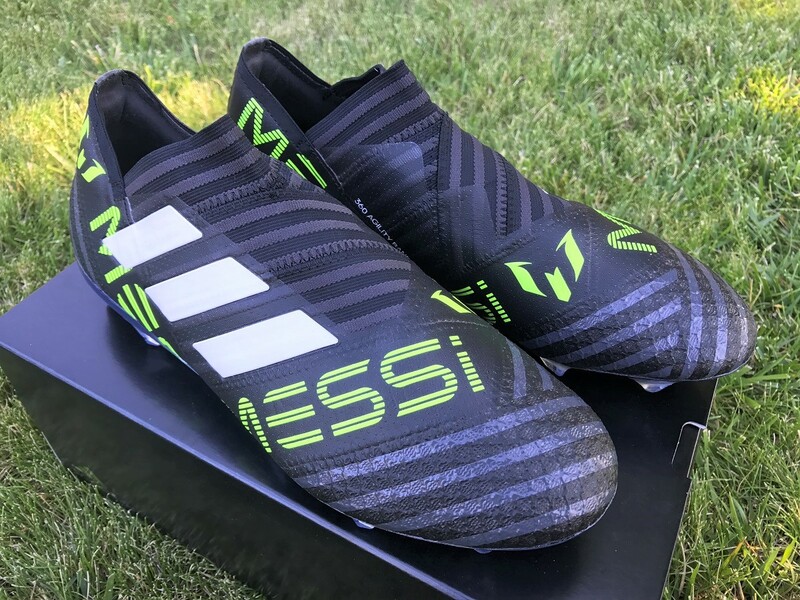 Even though adidas was shifting to a new style of boot, Messi obviously insisted that he get to keep the soleplate that works best for his game. It is a solid configuration that has a proven pedigree for providing quick release and added traction to enhance speed and acceleration. A mix of conical studs and triangle shaped blades navigate through the sole. Plus you got to love the iridescent effect produced under the right lights! In terms of touch and control on the ball, the forefoot is actually well textured with what is like a grooved zig-zag design. It offers enough definition to enhance first touch and feel as you come into contact with the ball, without taking away from natural feel. In fact, I’ve found that the Messi Nemeziz has a softer forefoot than the regular release, definitely a positive. Because the ankle is cut a lot lower than the like of Nike’s dynamic collar boots, a common question is how do they actually stay on your feet? Well, that is all thanks to the dual lock collar around the ankle, part of the agility bandage system, it locks your foot in through important cuts, without restricting your ankle. Think of it like a slightly tighter, well bound ace bandage that wraps around your foot! It is important to remember that this is a laceless boot. So, there are no laces to create the perfect tight fit. I repeat, there are no laces. This means you are relying on the structure of the boot to keep you locked in. As a result, the fit out of the box is tight and very snug. It needs to be. You might struggle to get your foot in at first, but the quickly dissipates as you give the structure of the boot some natural stretch. So, it break it down, this is a boot you are going to want to order to size. I’d stick with what the size that you normally wear, but only if you are fully aware that they fit snug. If you want to go Messi, there is a no price increase compared to the regular release version – both retail for $330. This is the first colorway release in the Messi series, but there is another planed to release in the next few days. So, if this colorway is not for you, there are more to come! Do you actually want to buy a pair? Well, that comes down to how much of a Messi fan you are! If you prefer his logo on your boots as opposed to Nemeziz text, then why wouldn’t you? If your question lies on the value of actually investing so much money on a laceless boot, then it becomes more complicated. Personally, I prefer the laced version as I enjoy determining how tight the upper is across my foot. But I can see the appeal to wearing a laceless boot, and honestly they are one of the best laceless boots you could ever end up wearing. You can currently find the entire Messi Nemeziz series available at soccer.com. 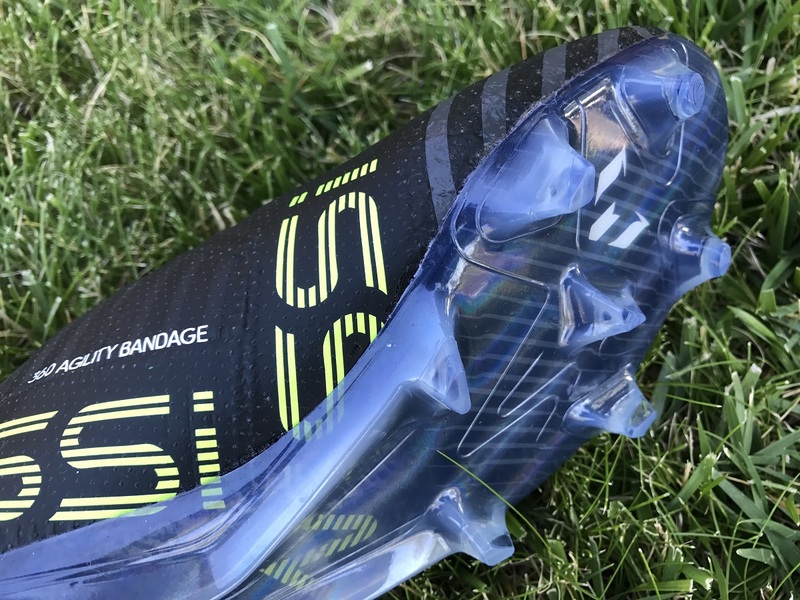 If you have any questions, comments or personal opinions on the Messi Nemeziz series, feel free to leave them in the comments below and we can get a discussion started.